This is an automated reply to the email message you just sent to Tumblr. Based on the content of your message (Ticket 696027), it sounds like you may have a question about using a custom domain with Tumblr. If so, the information below may help. If not, please just respond to this message and we will be happy to address the specifics of your request. You do not need to purchase a web hosting package to have a custom domain with Tumblr. You only need to purchase a domain from a domain name provider. If you are using a subdomain that has three or more levels, like www.mywebsite.com, follow the registrar’s instructions to point the subdomain to domains.tumblr.com. If you are using a domain that has only two levels, like mywebsite.com, follow the registrar’s instructions to point the domain’s A-record (IP address) to 66.6.44.4. Please note that you do not need to change the nameservers for your domain in any way. Also, make sure you’ve configured your blog to use a custom domain in the Settings area for the blog. You can access the Settings for a specific blog from the management page for that blog. Click on the blog’s title at the top of your Dashboard or under the list icon at the top right of the Dashboard. Then click Settings on the right side of the screen. If this information didn’t answer your question or resolve your problem, please just respond to this message and let us know. 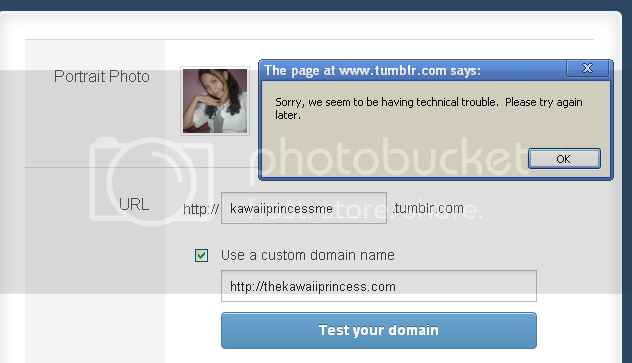 So for now, you will get an error when you try to visit http://thekawaiiprincess.com but I hope when it comes live, you would support and follow this blog as well. I will let you know when Tumblr fixed the issue. Thanks for everyone who tried to visit this blog since yesterday, special mention to Lhyzie Bongon. I will update everyone so please keep posted and sorry for this inconvenience. Tumblr, if you see this, please fix this problem asap! Thanks! Greatness Starts @Home Blogging Contest From Globe!